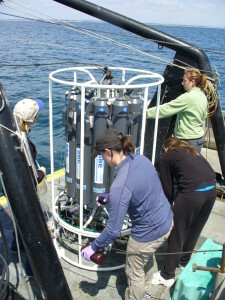 The University of Southern California Caron Lab is involved in a multi-institutional research project funded by the National Oceanic and Atmospheric Administration (Ecology of Harmful Algal Blooms: ECOHAB) to investigate and compare blooms of toxic algae that occur in Monterey Bay with those that occur along the coast of southern California in the San Pedro shelf region. The coast of California represents approximately 1,000 miles of the Pacific coastline of the U.S. and major fractions of the coastal economy and environmental resources of our nation. Alarmingly, blooms of harmful and toxic algae have increased in frequency and severity along this coast during the past few decades. Harmful blooms of dinoflagellates (e.g. Alexandrium, Lingulodinium, Cochlodinium) have become increasingly common, particularly in summer and autumn. Spring blooms of toxic Pseudo-nitzschia are now a recurring problem, first reported in central California during the 1990s and on an annual basis in southern California since 2003. Our primary objective is to develop a better understanding of the ecophysiological conditions leading to blooms and toxin initiation by Pseudo-nitzschia, by simultaneously comparing two “hot spots” for these blooms (Monterey Bay and San Pedro, California). Better understanding of these factors will lead to improved understanding of how bloom dynamics change in response to shifting environmental conditions, why “hot spots” exist, and ultimately provide improved monitoring, predictive modeling, and management decisions.